Abdollahpour, M., Shekari, A. (2014). Frameness bound for frame of subspaces. Sahand Communications in Mathematical Analysis, 01(1), 1-8. M. R. Abdollahpour; A. Shekari. "Frameness bound for frame of subspaces". Sahand Communications in Mathematical Analysis, 01, 1, 2014, 1-8. Abdollahpour, M., Shekari, A. (2014). 'Frameness bound for frame of subspaces', Sahand Communications in Mathematical Analysis, 01(1), pp. 1-8. Abdollahpour, M., Shekari, A. Frameness bound for frame of subspaces. 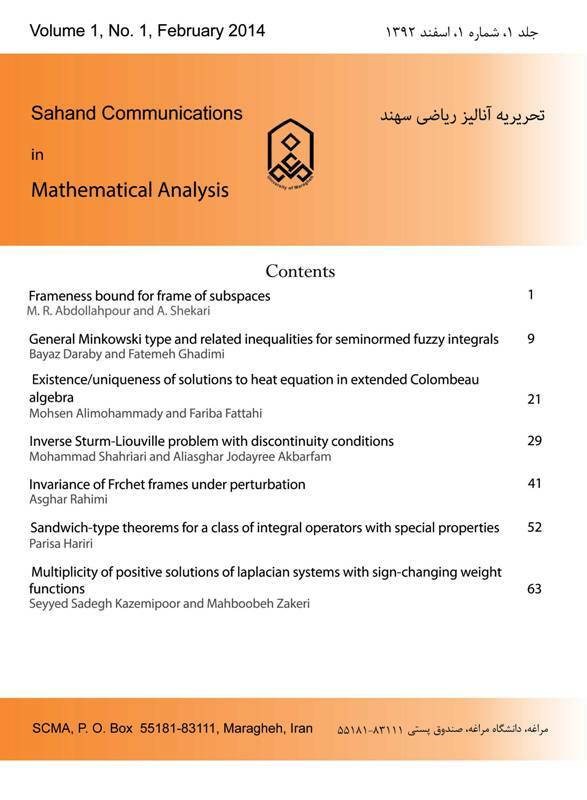 Sahand Communications in Mathematical Analysis, 2014; 01(1): 1-8. Department of Mathematics, University of Mohaghegh Ardabili, P.O.Box 179, Ardabil, Iran. In this paper, we show that in each nite dimensional Hilbert space, a frame of subspaces is an ultra Bessel sequence of subspaces. We also show that every frame of subspaces in a nite dimensional Hilbert space has frameness bound. M. R. Abdollahpour and A. Shekari, Ultra Bessel sequence of subspaces in Hilbert spaces, preprint. P. G. Casazza and G. Kutynoik, Frames of subspaces, Wavelets, Frames and Operator Theory (College Park, MD, 2003), 87-113, Contemp. Math. 345, Amer. Math. Soc., Providence, RI, 2004. O. Christencen, An introduction to frames and Riesz bases, Birkhauser, Boston, 2003. M. H. Faroughi and A. Najati, Ultra Bessel sequences in Hilbert Spaces, South-east Asian Bulletin of Mathematics, 32 (2008) 425-436.